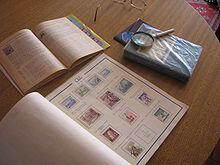 Stamp albums are a necessary item in the process of stamp collecting. The book itself is a loose leaf book which lets you add pages if your book gets to big. In this book you have postage stamps and postal stationery displayed in a specific book. 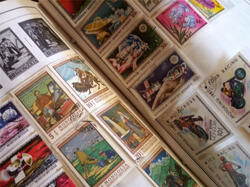 You can set the book up any way you choose; it all depends on how you categorize your stamps. If you have a special way how you go about setting up the books and you use more than one book, make sure to label the book so that you can keep your cataloging straight. 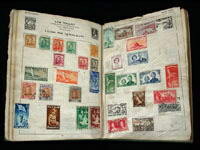 The layout of the stamps on a page are all a matter of choice, it all depends on how you the collector wants to display his stamps. 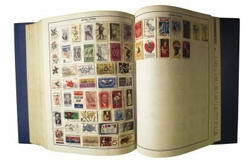 You can choose to have a page of stamps on one page or just a row of stamps with descriptions on the page. You can catalog by date the stamp was issued or how they were color coded. In the old days, descriptions were done by pen and paper, today in the age of computers, collectors use computer printer labels for a neater and more professional look. Some people purchase what they call preprinted albums, these books already have standard stamps, there is nothing that is worth any money, it is basically used as a starter kit. Other books have preprinted descriptions and what you use this for is as you collect the stamps you can correspond them to the correct description. Stamp albums fall under two general categories: "blank" and "printed." Printed albums present spaces with illustrations and/or information of each postage stamp that is to be put into each space. The variety of such albums is so amazing, so it would be well to examine just what the starter, or anybody in fact, should consider looking to make a selection.